The Secret U.S. Classic stars on Saturday and with rosters announced and start lists posted, the Gymternet is abuzz with speculation about the meet. Generally, the Classic is used to fine-tune routines, try out new skills and get one last competition under the gymnasts’ belts before the national championships get under way a few weeks later. It’s also viewed as a less important competition where good results don’t often implicate future success in the sport. However, that might not be the case. We take a look at past results from the meet. The findings are quite intriguing. This year the senior roster at the Classic features a plethora of future and past stars in the sport. From back-to-back all-around World Champion Simone Biles to individual Olympic Champions Gabrielle Douglas and Aly Raisman, the meet is packed with talent. Like these champions, past participation at the Classic, competing at the meet in at least some capacity — whether it be in the all around or on just one event — is a good step in making that year’s World or Olympic team. This has been the trend dating back to 2010. However, competing at the Classic and doing well at the Classic are two different things. In Olympic years, those that made the team had to be on their game, even at the meet. If a gymnast chose to compete less than four events, she had better knock those events out of the park (see chart). In years with World Championships, the story is different. 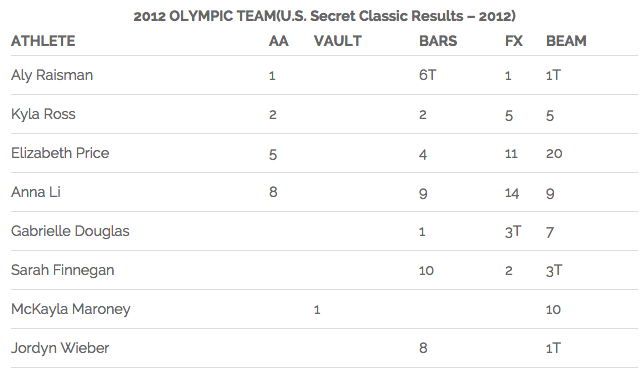 The obvious front-runners still performed well at the meet, such as Simone Biles and Kyla Ross. However, those members of the teams on the bubble, only show average results in the all around. Of course, not every World Championship has a team competition that relies heavily on all-arounders. Individual World Championship years have only four member teams, compared to seven in team years. But, similar to the Olympic year, if a gymnast is a specialist, she better make up for not showing all four. Looking ahead to this year’s installment of the competition, there’s a good chance those fans making the trip to Hoffman Estates, Ill., will be getting a preview of 2015’s Team USA. Much more so than in the senior competition, the juniors use the U.S. Classic as a qualifying event to nationals, as well as a chance to prove and test themselves in a pressure-packed situation. With the juniors the trends to success are a little trickier to spot. However, one thing’s for certain, since 1998 every age-eligable junior champion has made the Olympic team, except for three. Those who made the team include a prestigious list of Carly Patterson, Nastia Liukin, Shawn Johnson, Kyla Ross, Aly Raisman and Jordyn Wieber. This has to bode well for 2012 junior champ Simone Biles, as well as 2013 winner Bailie Key, and although she is not eligible until 2020, last year’s first-place finisher Jordan Chiles. As for the other juniors who made it to the Olympics, it might actually be better to not do so well at the Classic earlier on in your career! In 2008 Douglas tied for 10th in the all around and in 2009 McKayla Maroney was all the way down in a tie for 24th and only finished tied for 10th on her signature event, vault.